Imran Yusuf is a renowned as a skilful raconteur who seamlessly weaves socio-political satire with heartfelt introspection in his charmingly endearing trademark styling. Languid, punchy, cheeky and utterly loveable, Imran has established himself as a truly unique voice in the world of comedy. Imran has completed two UK tours with his solo shows “An Audience with Imran Yusuf” and “Bring The Thunder”, and now is performing his third solo show “Roar of The Underdog” which he took to the Edinburgh Festival in 2014. “Roar of The Underdog” is due to tour from Spring 2015. 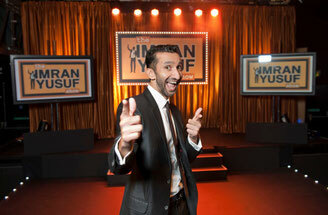 Imran can also be seen as a regular member of the team-based topical comedy show; The Cutting Edge at The Comedy Store in London.